It’s hard to believe that I moved to New York a little over a year ago. This has by far been the longest year of my life. I had a feeling my first year out of college wouldn’t be easy, but I wasn’t expecting it to be this tough. Since last July, I have graduated from culinary school (twice), was finally accepted by foodgawker, worked in a fancy pants restaurant in Manhattan, made my first two (three and four) tiered cake, became an aunt and a sister-in-law (squared), paid my own rent (that’s a big one), and was published in a Magazine. Talk about a year! But, it didn’t come without sacrifices. They should really put a huge warning label on the culinary industry if you ask me. *Warning* if you like seeing your family regularly, going home for the holidays, getting paid a decent salary or having the time, energy and money to hang out with your friends, this industry might not be for you! I mean, not too sure if anyone noticed, but I haven’t written on here in over 3 months! I cannot tell you how much respect I have for every chef that has the courage and will power to follow their dream. They sacrifice so much to do what they love. Many of them have two jobs. Chefs are talented, insanely hard working, stamina filled super humans. I’m just not one of them. 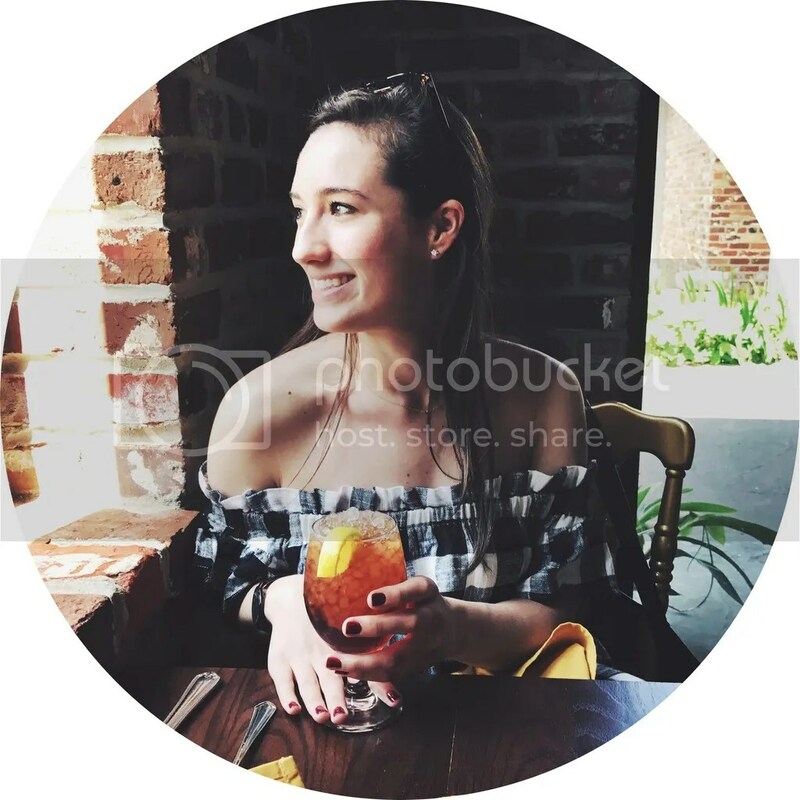 Thus, I’ve decided to take a break from restaurants and get back to what I really love to do; cooking at home, being with my friends, and, you guessed it, blogging. To bring this post full circle, I thought I would pay tribute to my first foodgawker acceptance, as well as the recipe that was recently published in Yum Food and Fun for Kids Magazine, granola. This new recipe is inspired by the recipe used at my old restaurant, Quality Italian, and is sweet, salty and insanely addictive. 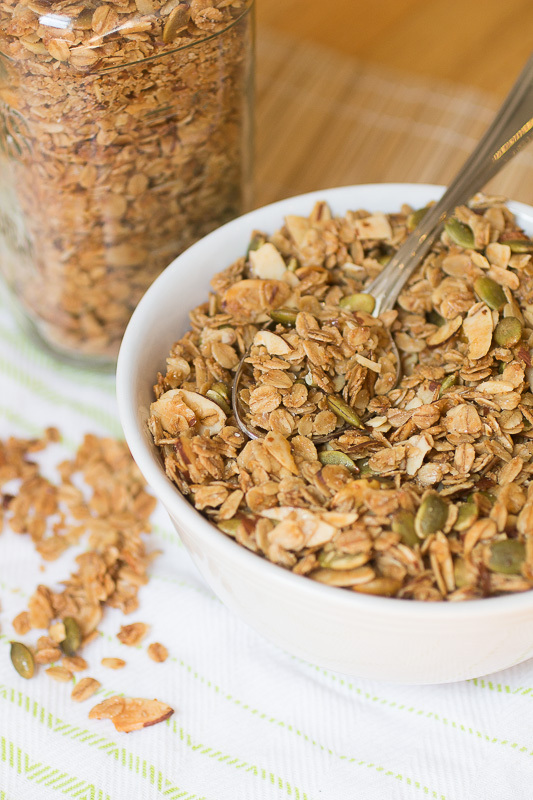 The olive oil in this recipe gives the granola a sophisticated twist, without compromising flavor. Now that i’ve tried it, I won’t be using regular oil any time soon. The olive oil in this recipe gives the granola a sophisticated twist, without compromising flavor. For a less salty version, try 1½ tsp salt instead of 2. Preheat the oven to 300 F. In a large bowl, mix together the sugar, maple syrup, and salt. Then add the oats, almonds and pumpkin seeds and stir until completely coated. Spread out on a rimmed sheet pan and bake for 1 hour. 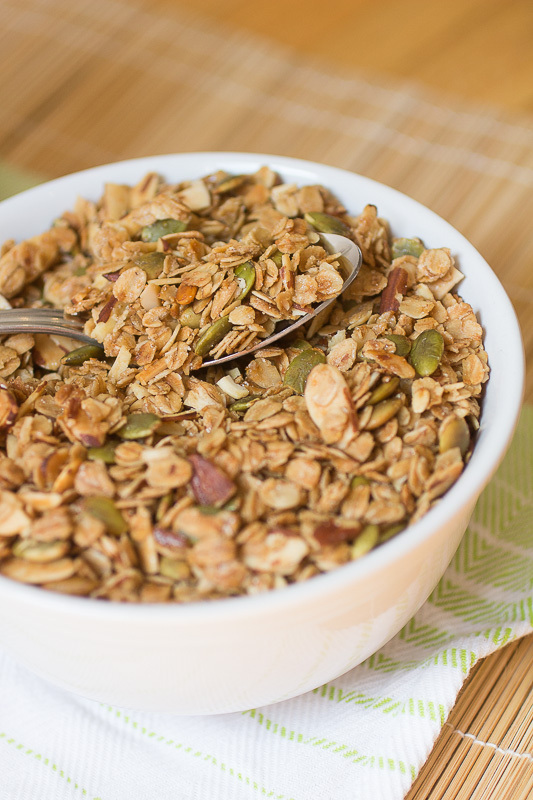 If possible, check on the granola every 20 minutes and stir to ensure even baking.